There are many factors that determine the amount of money you will receive each month. 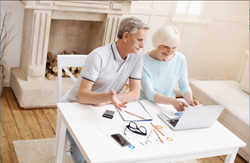 Given the high level of reliance on Social Security payments, understanding ways to increase the monthly payout can add thousands of dollars to your income throughout retirement. Recipients received an average monthly payment of $1,360 in 2017, according to the SSA, many households depend on this income for survival. The Social Security Administration makes an estimated 69.7 million dollars in Social Security payments each month to retirees. Recipients received an average monthly payment of $1,360 in 2017, according to the SSA, many households depend on this income for survival. For three out of five retirees, this income accounts for over half of total household income. Without these payments, the poverty rate among the elderly would drastically increase. Your birth year establishes your full retirement age or FRA. The FRA ranges from 66 to 67 years of age, for those retiring today. The age matters because anyone can begin receiving benefits at the age of 62. However, filing before your full retirement age will permanently reduce the monthly payout. Once you reach your full retirement age, you can claim 100% of your Social Security benefit. Waiting beyond the FRA will increase payouts for every month you wait until you reach the age of 70. Everyone born before or in 1954, has a full retirement age of 66 years old. Aside from the full retirement age, the age you choose to file for benefits has the highest impact on your potential payout. If you claim Social Security benefits before reaching your full retirement age, the benefit amount will decrease by up to 30%. For example, receiving your Social Security payments up to 36 months before your FRA will result in a 6.7% reduction, or 5/9th of a percent reduction for every month you claim early. The earliest you can qualify for benefits is age 62, which could give you five extra years of payments at a lower amount. For every year you postpone filing past your full retirement age, you can receive an 8% increase until you reach 70 years old. At that point, there is no pay increase for waiting longer. If you delay filing for Social Security benefits until the age of 70, you can receive up to 76% more monthly than an individual who claims their benefit at 62. Social Security payments rely on your work history, which is determined by how much money you earned and how many years you worked. Calculating the full benefit considers your 35 highest earning years and will adjust for inflation. Those who have not worked all 35 years will have zeros calculated into the formula to determine the 35-year average. Workers who were not employed may receive half of the spouse's benefit when reaching retirement age. Work history can also lower your Social Security benefit if you file before reaching the full retirement age. Claiming your benefits before the full retirement age will result in a Retirement Earnings Test on income, which calculates benefits to consider current earned income while receiving benefits. When you surpass the threshold, you could lose $1 in benefits for every $2 in income above $17,040. Earning over $45,360 will result in $1 in benefits withheld for every $3 in earned income. After reaching full retirement, there are no income limits. The IRS can tax up to 85% of benefits based on household income. The IRS uses the adjusted gross income, or AGI, to determine taxation on Social Security benefits. This includes both passive and earned income. In 1983 Congress included an amendment to the Social Security Program, which gave the Internal Revenue Service the ability to tax Social Security benefits. Currently, you will not pay taxes on earnings up to $25,000 per year for individuals and $32,000 for couples. Individuals who earn between $25,000 and $31,999 and joint filers earning between $32,000 and $43,999, pay taxes on up to 50% of Social Security benefits. Earning above these thresholds can result in 85% of the Social Security benefits becoming subject to taxation. The above amounts have not been adjusted for inflation in over 34 years, resulting in over half of Social Security recipients owing taxes on their benefits. In addition to paying taxes at the federal level, some states also tax Social Security benefits. Some states provide residents with low-income exemptions. For example, Minnesota, North Dakota, Vermont, and West Virginia mirror the federal tax schedule. While Colorado, Connecticut, Kansas, Missouri, Montana, Nebraska, New Mexico, Rhode Island, and Utah tax all Social Security benefits, with limited income exemptions. State level taxation does not directly impact your Social Security check, but it can determine how much money you get to keep. If you are burdened with high amounts of credit card debt and are struggling to make your payments, or you’re just not seeing your balances go down, call Timberline Financial today for a FREE financial analysis. Our team of highly skilled professionals will evaluate your current situation to see if you may qualify for one of our debt relief programs. You don’t have to struggle with high-interest credit card debt any longer. Call (855) 250-8329 or get in touch with us by sending a message through our website at https://timberlinefinancial.com/.